Our 2019 season runs from April 12th through October 20th. Rates include 2 adults and 3 children (under 18). One camping unit and one vehicle per site. Rates are based on site type, not type of unit on site. 3-night holiday minimum stay. 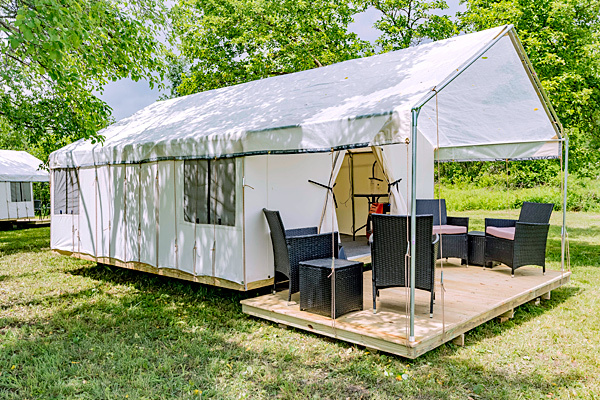 Cancellation Policy: Campsite Holiday and Special event weekends are paid in full and non-refundable and non-transferable. All Rentals are paid in full, non-refundable and non-transferable. Everything marked with *, no refunds given. Other reservations are a $20.00 cancellation fee with a credit given byway of a campground card for use in the same season. If a subsequent reservation (using a campground credit) is cancelled, an additional $20.00 cancellation fee will apply. Cancellations of any type made within 7 days of the scheduled date of arrival will have all deposits lost. See the Activities schedule for weekends which are paid in full and non-refundable. If you are a no-show for your reservation, your deposit will be lost. Note: Cancellation policies for rentals may differ and are listed separately below. Additional Children $5.00 per night. Under 3 free. Daytime Visitors $5.00. Must depart campground by 10:00 PM or will be considered overnight guests and be billed as such. Early Arrival / Late Departure Campsites: $2.00 per hour, if available (early season). Mid-season and holidays $4.00 per hour. Rentals: $4.00 per hour, if available (early season). Mid-season and holidays $8.00 per hour. Use of Private Golf Cart $10.00 per stay. $40 required deposit to bring your own golf cart. 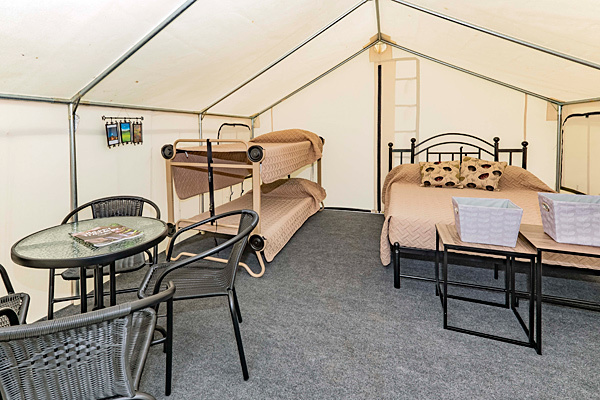 Additional Tent on Site Cost of site per night, includes 2 adults & 3 children. Restrooms with showers and dumping station are provided. Contact us for weekly and Seasonal camping rates. 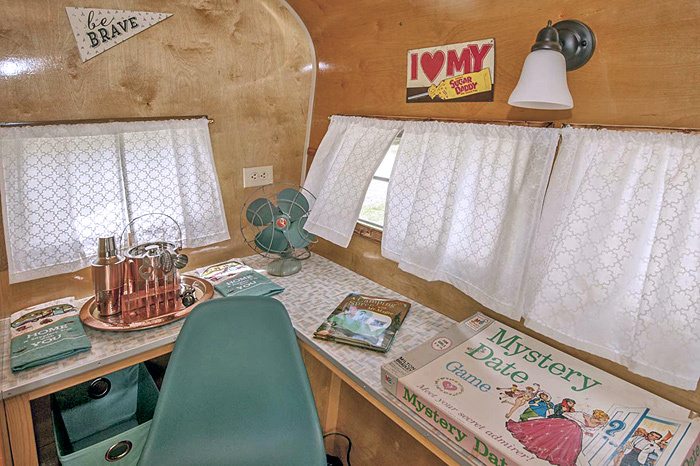 Each of these trailers provides an authentic and unique lodging experience, painstakingly restored with some modern interior twists, decorated and furnished in a manner that will give you an opportunity to literally step back in time. There is an outdoor area with a table and chairs, an outdoor BBQ with tools and fire ring. 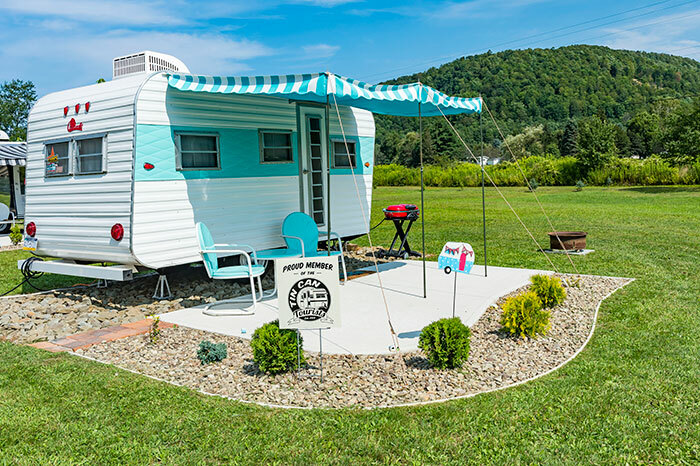 The Classics Vintage RV Park reservations must be paid in full, are non-transferable and non-refundable. 2-night minimum rental, 3-night holiday minimum rental. If you are a no-show for your reservation, your deposit will be lost. No rain checks given for unused dates. 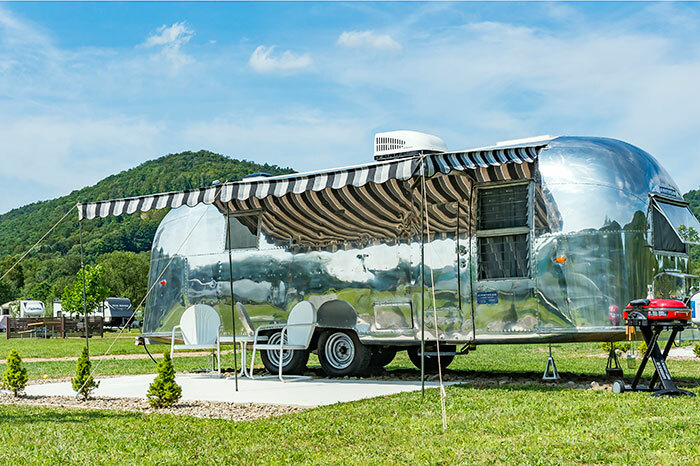 Click here to visit our dedicated “The Classics Vintage RV Park” website, where you’ll find more information about this unique themed camping experience. Rates include 11% room tax. Based on 2 adults plus a $50.00 damage deposit. 2 Adults only, no pets or children. Minimum 2 night stay on regular weekends and 3 nights on the holidays. 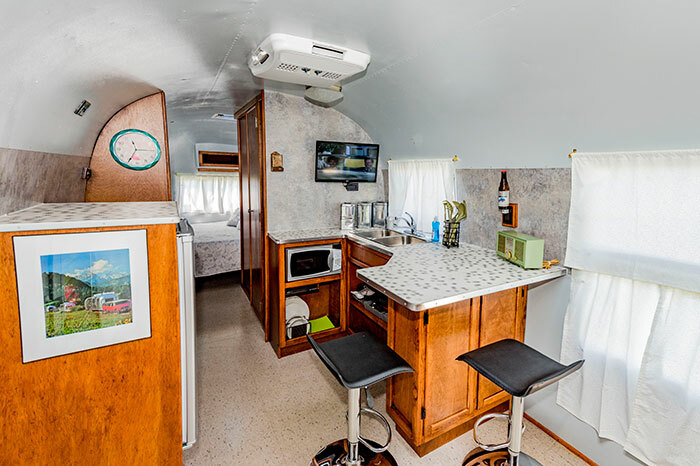 This unit is a 1966 Comanche travel trailer that we have named Betty. She has a rear queen size bed with lots of beautiful linens and pillows for snuggling, a TV with a DVD player only, is heated, and offers air conditioning, a toilet (with showers nearby), kitchen facilities (with microwave, coffee pot, dishes, silverware and cups), a front lounging area with dry bar area, an outside BBQ grill with tools, fire pit, and more. In case you were wondering, the Dodge Dart convertible does not come with the site (although you are welcome to bring your own), and the vintage-style bicycles are available for rent. 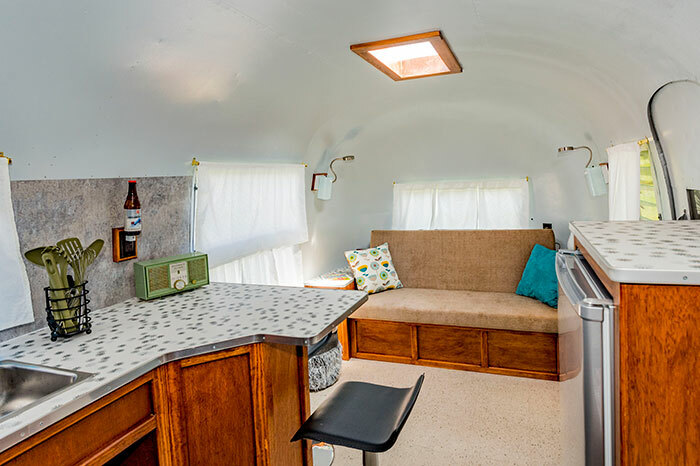 Let’s meet Ethel our 1961 Overlander Airstream, she hails from the Sunny state of Florida. She has underwent a full restoration from the frame up. 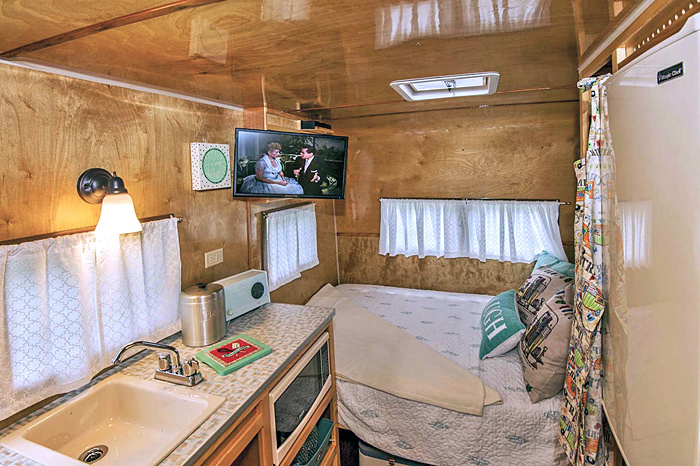 She has all the modern conveniences of this century, she has a king size bed, a full bath with tub & shower, toilet, and sink. She has an eat in kitchen with refrigerator, microwave, coffee pot, dishes, silverware, an outdoor grill for cooking. She has a lovely living room area with tv that plays dvd’s only. She has heat and air conditioning for your comfort. She is completely decked out with all the linens, towels etc needed for your stay. 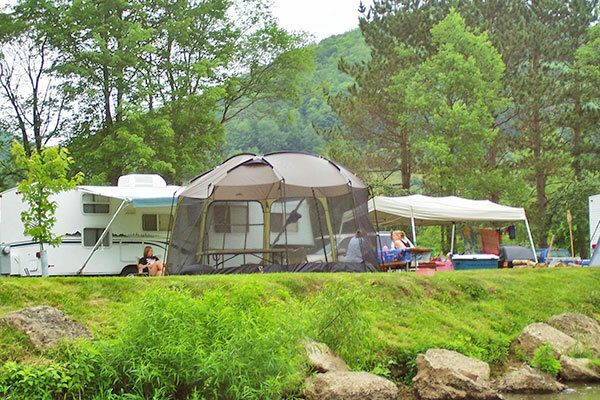 The new Glamping Tent sites at Allegheny River Campground are now available. 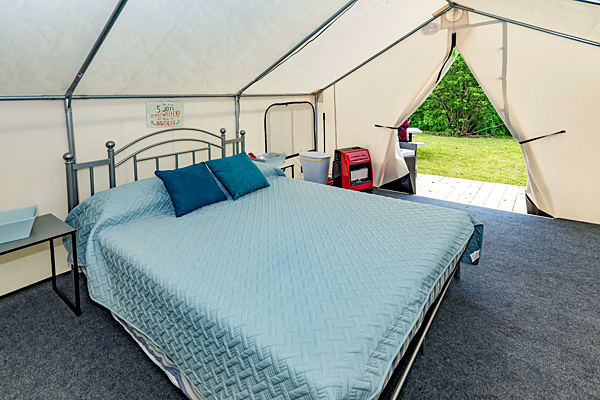 Stay in one of our spacious 12' x 14' Glamping Tents with front and rear doors, 4 windows, deck, 12 volt lighting, and heat. Your choice of a queen bed (suitable for couples) or a full bed and bunks (suitable for families). Bring your own linens. 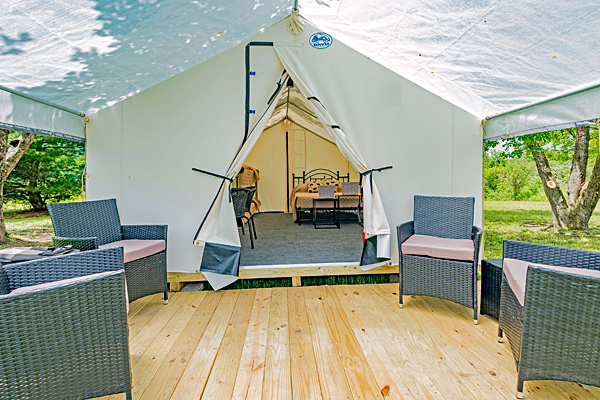 Glamping Tent reservations must be paid in full, are non-transferable and non-refundable. 2-night minimum rental, 3-night holiday minimum rental. If you are a no-show for your reservation, your deposit will be lost. No rain checks given for unused dates. Additional Adults Call to inquire. Additional Child (maximum 3 children) $5.00 per night. Under age 3 free. Early Arrival / Late Departure Rentals: $4.00 per hour, if available (early season). Mid-season and holidays $8.00 per hour. No pets in Glamping Tents. $50.00 damage deposit required at time of reservation, refunded after your departure via mail. Cabin reservations must be paid in full, are non-transferable and non-refundable. No rain checks will be issued for unused dates. PA and room taxes included. Rates are based on 2 adults, 3 kids. Any extra adults over 2 are charged per night. It will sleep 4 adults comfortably, with two queen beds. You must bring your own linens and towels. 2-night minimum rental, 3-night holiday minimum rental. If you are a no-show for your reservation, your deposit will be lost. Each Additional Child $5.00 per day. Under 3 free. Max occupancy is 6 people. 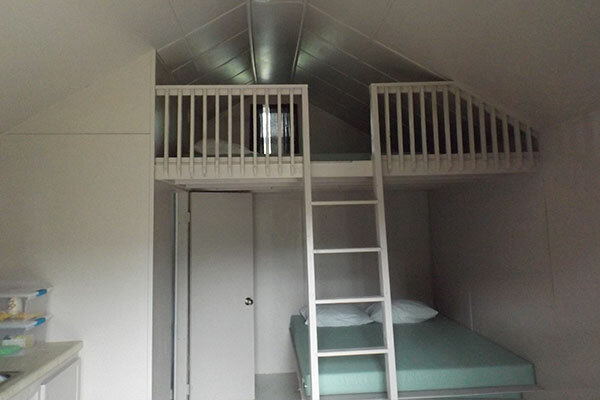 Cabins are equipped with A.C. / Heat, microwave, coffee pot and refrigerator. Fire ring & picnic table. Free standing charcoal grill. 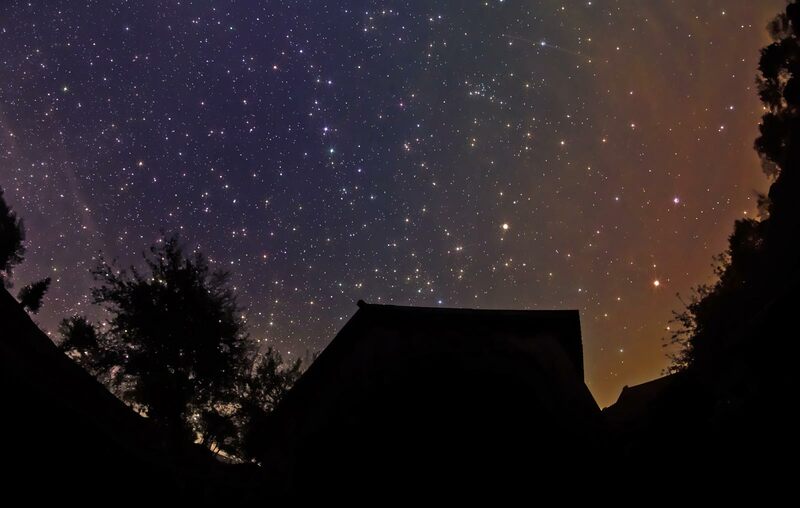 Pet-friendly cabin available upon request ($10.00 fee per night per pet, maximum 3 pets). Otherwise, no pets in cabins. $50.00 damage deposit required at time of reservation, refunded after your departure via mail. Full Service Cabins are equipped with A.C. / Heat, full bathroom, microwave, apartment sized refrigerator, coffee pot, TV with DVD player only. Fire ring & picnic table. Free standing charcoal grill. 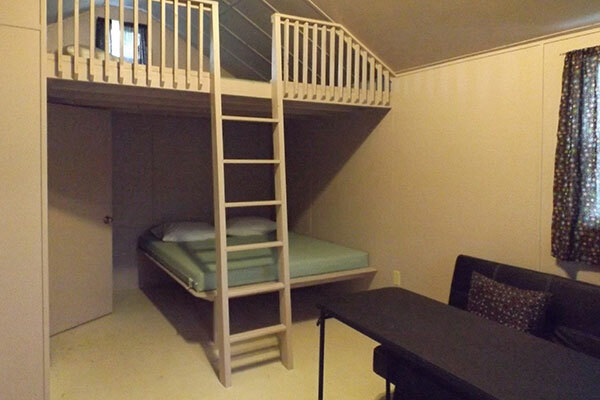 Pet-friendly cabin available upon request ($10.00 fee per night per pet, maximum 3 pets). Otherwise, no pets in cabins. $50.00 damage deposit required at time of reservation, refunded after your departure via mail. Cabin reservations must be paid in full, are non-transferable and non-refundable. No rain checks will be issued for unused dates. PA and room taxes included. Rates are based on 2 adults, 3 kids. Any extra adults over 2 are charged per night. It will sleep 4 adults comfortably, with two queen beds and pillows. You must bring your own linens and towels. 2-night minimum rental, 3-night holiday minimum rental. If you are a no-show for your reservation, your deposit will be lost. Restroom, shower, A.C. / Heat, coffee pot, TV with DVD player only, refrigerator and microwave. Fire ring & picnic table. Free standing charcoal grill. $50.00 damage deposit required at time of reservation, refunded after your departure via mail.